FedEx have released a new commercial showcasing that they help make E-commerce easy for small businesses. The 30-second spot, titled “Goofy Glasses”, features two employees of Ed’s Novelties store talking to each other. “Boy, we’re shipping a ton of these goofy glasses”. “Yeah, well, we gotta hand it to FedEx. They help make our E-commerce so easy and now we’re getting all kinds of new customers”. “This one is going to New Zeeland”, says his colleague. 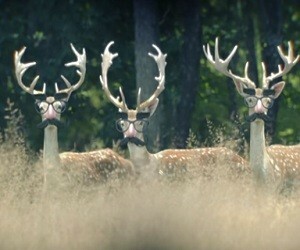 The next scene features two men at hunting in the wilderness who, after seeing three deers wearing goofy glasses, say that there was a false alarm. “Hey, you guys are going to scare the other deers”, shouts one of the men to the deers. “Idiots”, adds to himself. The commercial ends with the voiceiver saying “Providing global access for small business. FedEx”.